Walking is a good exercise that has many health benefits. Daily walking helps to keep your heart healthy, manage weight, improve your digestion, and boost your mood. Even just walking for 10 to 30 minutes a day can do wonders for your body. There is also evidence to suggest that the benefits of walking can even help you live longer. The main advantage of walking is that it is a form of exercise available to most people. Walking is a free exercise and is a great way to prevent complications associated with a sedentary lifestyle. The only equipment you need to include in walking in your daily exercise routine is a good pair of shoes and the appropriate clothing. In this article, you will find out why walking is one of the best forms of exercise. You will also find out how many miles you have to walk a day to lose weight, strengthen your immunity, and improve your cardio health. Walking is a beneficial form of exercise available to most people. A daily 15 to 30 minute brisk walk can do a lot to boost your general health. Apart from the health benefits of walking, there are also many social benefits. For example, walking with others gives you a great opportunity to spend time with your partner or friends. How much walking do you need to do every day to enjoy its benefits? Most doctors say that taking a brisk walk for 30 minutes will start to make a difference to your health. (1) A daily 30-minute brisk walk will mean that you walk about 2 miles a day. Of course, even if you can’t manage to walk 2 or 3 miles a day, any amount of increased physical activity will benefit your health. Let’s look in more detail how walking for fitness is a good cardio exercise that helps you lose weight and improve your overall health. One of the reasons why walking every day is good for you is that it promotes weight loss and helps maintain a healthy weight. For example, walking can also help you lose weight if you combine it with a healthy diet. If you are overweight or obese, it is important to speak to your doctor before starting any health fitness program. You could start by walking for 20 minutes every other day and then gradually increase the frequency. You should start noticing weight loss when you walk briskly for 30 to 60 minutes every day. You can find more details in my article “How Much Walking You Need to Lose Weight“. A 30-minute walking workout every day is a good exercise that promotes a healthy heart and circulation. You can use a pedometer to track your daily walking habit and set a goal of walking for at least 3,000 steps every day. Of course, there are even more cardiac health benefits if you walk at least 3 miles every day. If you want to help boost your cardiac health, you can learn about some of the best foods to include on a cardiac diet. Brisk walking every day also helps treat symptoms of hypertension and reduce your risk of stroke. To reach a goal of 10,000 steps daily, you can break up the time into regular walking exercises throughout the day. For example, walking for 30 minutes 3 times a day will help you reach a goal of 10,000 steps to lower blood pressure. You can find out about some natural remedies to help lower blood pressure fast and help lower your risk of coronary heart disease. Walking is good exercise that can help to improve your memory and strengthen cognitive health. To get the cognitive benefits from walking for 3 miles a day, you can also add these foods to your diet that help improve brain health. Walking for 10 to 30 minutes a day can make a great difference to your mental well-being. Find out what else you can do to help quickly boost your mood and alleviate symptoms of depression and anxiety. You may find that you have more energy if you incorporate daily walking in your exercise regime. There is some evidence that moderately intensive walking can have the same energizing effect as drinking a cup of coffee. If you constantly feel tired and fatigued, find out some of the best ways to boost your energy. Taking a walk after your meal can help improve your digestive health and help prevent blood glucose spikes. There are many ways that you can improve your digestion naturally. For example, learn about the best teas that relieve many symptoms of stomach upset. Walking for 3 or 4 miles a day can help to improve some of your symptoms of diabetes. Walking for one hour is an effective physical exercise that will help you cover a distance of about 3 or 4 miles. As well as regular brisk walking to manage diabetes symptoms, you can learn about delicious foods that help control type 2 diabetes. One of the things that walking does for your body is to strengthen your immunity and overall health. To help keep yourself healthy and reduce your risk of infection, find out about 10 ways to boost your immunity today. You may also be interested to learn about herbs and supplements that help to keep your body healthy. Because walking as an exercise which is so good for you, it comes as no surprise that walking can help delay aging. Many studies have pointed to the benefits of walking for 30 minutes a day or more for your longevity. Walking is a great low-impact exercise that can benefit you if you have symptoms of osteoarthritis. Find out how to relieve arthritis pain naturally by adding anti-inflammatory foods to your diet. You can also learn about some of the best supplements for treating knee osteoarthritis. One of the benefits of walking a mile a day or more is that you can greatly reduce your risk of developing type 2 diabetes. Researchers have found that moderate exercise such as walking can help protect against diabetes. Some studies suggest brisk walking for at least 150 minutes every week. (26) This would be the equivalent of walking at a fast pace for one mile twice a day. 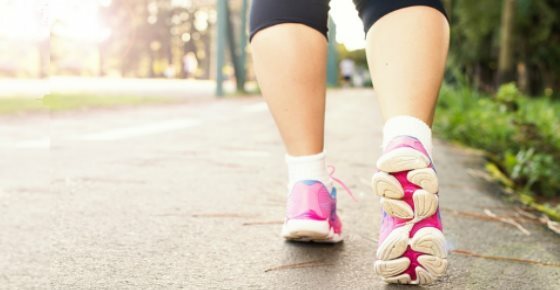 So, if you already average 5,000 steps a day, try increasing your average walking time to over 7,500 steps. At least 30 minutes of this walking time should be brisk walking of over 100 steps a minute. You should know how to identify the early signs of type 2 diabetes to help take steps to prevent the disease from developing. A long brisk walk will help reduce your levels of anxiety, improve your heart health, and help you sleep better at night. The daily walking exercise helped also to burn 300 calories a day. To help you get to sleep faster and improve your sleep duration, learn about the best essential oils for insomnia. You may also find that a weighted blanket helps you enjoy a better night’s sleep. Because walking as a form of exercise is so good for your health, it can also help fight against cancer. Although there is no single food that can help eliminate your cancer risk, you can learn more about the anti cancer diet. Incorporating healthy foods along with positive lifestyle choices such as walking can help lower your risk of the disease. Weight loss – If you want to walk to lose weight, try an incline walk as it will help you burn more calories. Shoes – Wear flexible, cushioned, comfortable and lightweight walking shoes. Water – Drink water before and after your walk. In a warm weather take a water bottle with you. Walking technique – Walk at a steady pace and swing your arms freely while walking. Look straight ahead and keep the chin parallel to the ground. Sneak 15 minutes of walking into your day. Try parking further from your office and walking the rest of the way or commit to walking for 15 minutes before making dinner in the evening. Walk and talk. Next time you need to call a friend, get up and walk around. It’s an easy way to squeeze activity in without even noticing it. Get up and walk around the office. Visit a co-worker, get a glass of water or go to a bathroom on another floor. Any movement counts. Daily walking is an excellent habit and it’s also one of 70 habits featured in my e-book 70 Powerful Habits For A Great Health.